BACKGROUND: Laparoscopic total gastrectomy (LATG) has not become as popular as laparoscopic distal gastrectomy (LADG) because of the more difficult reconstruction technique. Despite various modifications of reconstruction methods after LATG, an optimal procedure has yet to be established. In this study, we show our overlap reconstruction technique after LATG and evaluate the feasibility and safety of this method. Technical procedure: Before full mobilization of the abdominal esophagus, the esophagus was transected with an endoscopic linear stapler. After the transection of esophagus, upper side of esophagus was mobilized and stomach was removed. After jejunojejunostomy was performed through a 5-cm midline minilaparotomy, preparing a 40-cm Roux-en-Y jejunal limb, endoscopic linear stapler is inserted into jejunum and move to esophagus hole. Overlap anastomosis was performed, and entry hole was closed with laser knot methods. PATIENTS and METHODS: 33 patients were underwent LATG from 2004 to 2010. 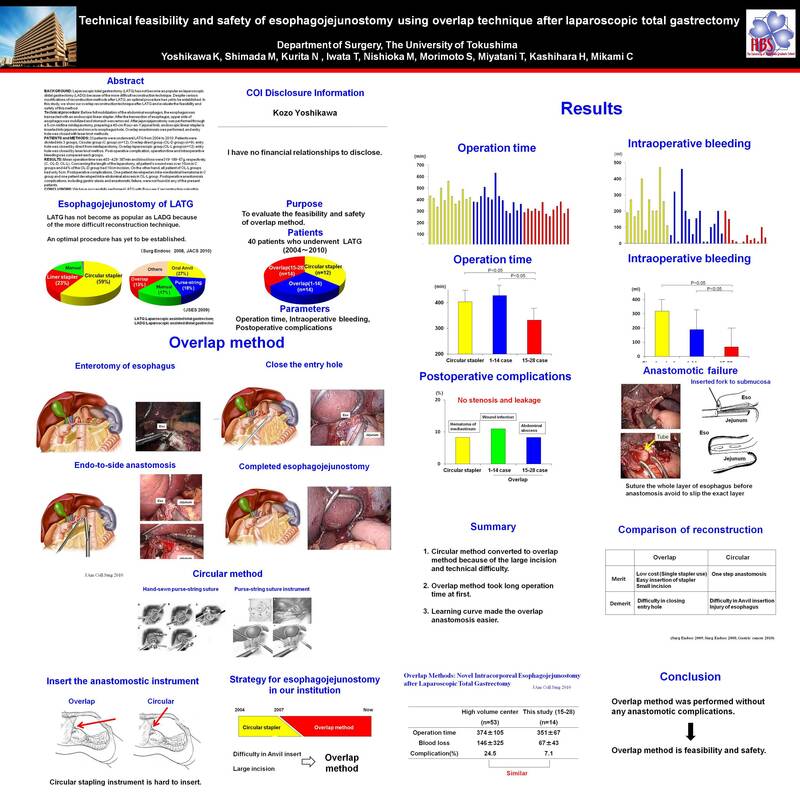 Patients were divided into 3 groups, Circular group (C group) (n=12), Overlap direct group (OL-D group) (n=9): entry hole was closed by direct from minilaparotomy, Overlap laparoscopic group (OL-L group)(n=12): entry hole was closed by laser knot methos. Post-operative complication, operation time and intraoperartive bleeding was compared each groups. RESULTS: Mean operation time was 403-428-387min and blood loss were 319-189-67g, respectively. (C, OL-D, OL-L). Concerning the length of the laparotomy, all patient’s wound was over 10cm in C groups and 44% of the OL-D group had 10cm incision, On the other hand, all patient of OL-L groups had only 5cm. Postoperative complications, One patient developed an intra-mediastinal hematoma in C group and one patient developed intra-abdominal abscess in OL-L group. Postoperative anastomosis complications, including gastric stasis and anastomotic failure, were not found in any of the present patients.